In the sandy dunes of the northern Negev desert between Arad and Be’er Sheva, 130 students who belong to a local Bedouin tribe, study at the Al-Sayed Sci-Tech School. One of the eight schools that the Israel Sci-Tech Schools Network operates for the Bedouins of Israel’s Negev desert, the high school was built in 2010. The school’s curriculum, which includes general studies, also has a special focus on electrician studies for boys and child daycare classes for girls. “Before this high school and others that were established for the Bedouin community through the Israel Sci-Tech Network, many in the Bedouin population in the Negev simply didn’t have a high school education available to them,” said Shai Lewinsohn, Israel Sci-Tech Network’s director of Resource Development and External Affairs. “There were Bedouin regional schools, but they were located far away from the isolated Bedouin tribes and therefore only a small percentage of Bedouin students were able to attend high school,” Lewinsohn told Tazpit. This is the story of the Al-Sayed tribe in the northern Negev whose teenagers attend the Al-Sayed Technological School. 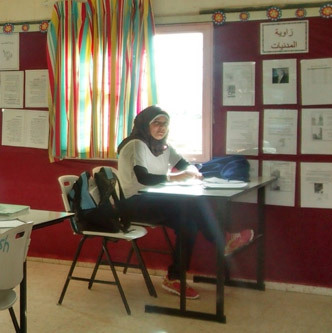 Of the eight high schools operating for Bedouin students by the Israel Sci-Tech Schools Network, Al-Sayed is the only one that offers an exclusively vocational program. The student population is comprised of 60 percent girls and 40 percent boys. Saleem himself has worked in a factory in Beer Sheva most of his life and today serves on the high school’s parent board. The 57-year-old grandfather is from the Al-Sayed tribe, an Arab nomadic tribe whose original tribal head came from Egypt around 200 years ago and settled in the Negev desert. Today, the tribe numbers around 3,500 people, where the average family has around 10 children. Students at the Al-Sayed Sci-Tech School, most of whom are from the Al-Sayed tribe, study Arabic, Hebrew and English as well as Bedouin heritage and the history of Israel. The students come from a weak socio-economic background and a great number of students suffer from learning disabilities as a result of inter-family marriages. In addition, the Al-Sayed community has one of the highest rates of deafness in the world – about 5 percent of its members have been born deaf as one fourth of the community carries the recessive trait. Al-Sayed is part of the El-Kasum Regional Council, which has seven villages and about 45,000 residents. The other Bedouin high school in the regional council stands in the Umm Batin village, with many of its graduates going on to study at higher education institutions in the south such as Sapir and Ben Gurion University. Since Israel Sci Tech Schools Networks (ISTSN) opened the Bedouin schools, the dropout rate among boys and girls is almost zero. ISTSN works closely with tribal and clan leaders to build trust with each tribe while also working with the Israeli government and donors to upgrade the schools. The other seven Bedouin schools are regular high schools which offer special tracks in biology, environmental studies, computers, physics, and other subjects. “Once the students finish with their high school education, there is an employment coordinators that helps graduates find work in their fields,” Mohamed Abo-Hasin, an English teacher at the Al-SayedSci-Tech School, told Tazpit. The Israel Sci-Tech Schools Network was established in 1949 and is the largest education network in Israel, operating over 200 institutions in 52 local authorities from the north to the south of the country. The network serves all sectors of Israel’s populations including secular, religious, and ultra-orthodox streams of Jews, as well as Arabs, Druze and Bedouins. To date, the Israel Sci-Tech Schools Network has 100,000 students and over 500,000 graduates.